The job candidates always lands up in answering a lot of questions asked to them while being interviewed for a Grocery store. For all the job seekers, some questions may be more personal in nature, where as some would be pin point specific to the job. When a person is called for an interview, he/she should do homework to answer the common questions that would be asked during the interview by the employer. Preparing for the questions will automatically make you more convincing of the job you applied for. The hiring employer will most probably ask you about your past experience to rectify whether you have experience in the same industry or not. If you have previously worked in a Grocery store then you need to discuss all the skills and accomplishments of the past job. If don’t have any experience in the same industry then don’t sit mum in front of the interviewer, just think about your duties which some or the other way relates to the grocery store post you have applied for and speak on those by correlating them both simultaneously. If you can discuss your previous duties of the grocery store and relate them to the services you can offer, it definitely makes a strong effect on the employers mind. The grocery store jobs takes out the whole body stamina, so it is important for you to be very energetic with constant stamina throughout the day. So it is good to discuss a bit about your daily workout routine and tell the employer about the various athletic events you participate in, because the employer knows that every athlete can handle stressed out work in the best way possible. Also it enhances your image as a multi task handling person with lots of energy to do all the given work in the given deadline. So discussing about this may help you in impressing the interviewer. The grocery store workers sometimes have to go across some of the difficult customers who are really a challenge for the workers to handle with. So to answer this question, think deeply about the situation and how you would handle it in a positive way that the upset or the difficult costumer is satisfied with the solution you offered to him at that specific point of time. Also you can simply focus on the SAR method which stands for “Situation Action and Result”. By learning about this method you can give a detailed description of handling the tough customers in grocery stores. This will help you to convince the interviewer that if some unwanted situation comes, you will positively handle it in the best way possible. The managers for grocery stores have all the accountability for the P&L (Profit and Loss). They are made to maintain the sales of the store in every best way possible and also to keep a track record of the P&L of the store. If the employer asks you about the P&L duties in the previous job experience then one should always answer in the best creative way possible rather than saying “No P&L duties handled before” this would greatly affect your whole interview. If you had no experience of P&L duties then you can do a bit research on “P&L duties of a Grocery Store”; Google will help you for this with many option to select from. For example; you can reply as “In low sales period, you used to send some of the extra staff earlier than usual time, to cut short the extra labor charges”. More over you can discuss about keeping a check over the quality and quantity of the products in the grocery store and the feedbacks of the customers for the improvement of sales. Here the preparation part is over; now let us focus on the picture inside the interview room. When you are called for an interview, the interviewer generally asks you hard questions so that they can put up a part of the big pressure that will be experienced while you are on roll job in a grocery store. This is a well organized technique used by the interviewer so that they can select the best out of many. So if you want to get selected in a grocery store, then you need to answer the following questions very well. 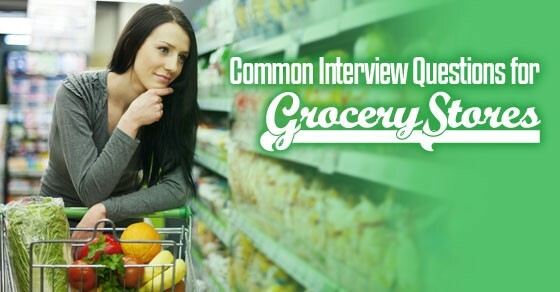 The following mentioned are few grocery store interview questions for job interviews. 1. Tell me about a situation you failed in and how did you deal with it? What did you learn from it? This standard interview question is asked to check that how much you know about yourself. In this case you need to think quickly of a work situation that didn’t turn out as expected and then you need to accept the mistake made. Lastly, you need to tell how you improvised it, accordingly what it taught you and how will you handle the same situation without repeating the same mistake again. With this organized answer the interviewer will be convinced that if the same situation arises again you will perfectly handle it and not ruin the environment of the grocery store. 2. Why do you really want a job in Grocery Store? This commonly asked interview question is a great opportunity for you as here you can easily elaborate on your previous work experience co-related with the things you can offer in your services to the grocery store. You need to describe every single thing in a systematic and detailed format. For example; You previously worked as a accountant in a MNC but now with the change of situations you need to work in a grocery store and you have been asked this possible question in an interview, so your reply should be that “as I have worked as a accountant previously and I know all the aspect of account related problems, I would rather fit as the account manager of the grocery store and in addition will manage all the accounts and keep a track record of the growth of the sales every month”. Answering this common question for interview with confidence, can probably be the best way to convince the interviewer to appoint you for the post you have applied for. It is one of the oddest and typical job interview questions asked during a grocery store interview. None of us want to reveal once weaknesses so you should never tell about weakness, instead you can answer “Right now I can’t think of any reason for not hiring me, where as I have a dozen of reasons why you should award this job to me”. Then accordingly you should go on focusing on why they should keep you. If again the interviewer asks you about your weakness then you have to be honest. You can tell the interviewer about the weakness with that you have put a lot of efforts and now you have overcome that weakness. This statement of yours will make the interviewer more clear about you and will be satisfied that you will not repeat the same mistake again in near future if selected for the job in the grocery store. 4. What do we expect from you for the first six months if you are selected? If you have done the above mentioned preparation then this most asked interview question will be an easy one for you to answer, tell them a full strategy of your work for the respective post you applied for. Tell the full work in a very presentable way and let them know that by hiring you it will make a difference. Tell them about your multi-tasking skills in detail and if possible tell them your previous work achievement in the first six months of your previous job, surely this will help you make a positive image in front of the interviewer and he may think to hire you for the best of business. 5. How does your past professional experience make you suitable for a job in grocery store? The thing that really matters here is the one successful accomplishment correlated to the upcoming tasks of the post you have applied for, it may be a sports achievement, or a personal achievement, and you just have to correlate both in the most impressive way possible. It will definitely work for you to answer the question in a positive manner. For example; you worked as the stock manager in a gallery before and now you are in for the grocery store interview, so you can convince the interviewer by saying that you used to maintain the stocks for the gallery and kept a check on it. And if you get selected for this grocery store job, you will additionally keep a check over the rotation of the stocks in the grocery store and always keep the stock up to date in addition of all the duties given to you for the specific post. 6. Why do you want to work with ‘Us’? This is one of the key tools that the interviewer uses in an interview to judge that whether you have done your homework about the grocery store or not. You should always come prepared with all the grocery store details for the interview. If you have done the research work perfectly then you can blow the environment by giving all the deepest details of the store with confidence and also giving positive reasons to join for the job. This also justifies that how much serious you are for the respected post you applied for in the grocery store. ii. Your experience till date. v. The best things in you. vi. All the benefits which you will provide to the grocery store if they hire you for a specific post. When you speak about yourself keeping all the above points in mind the interviewer will notice your confidence and enthusiasm. 8. We are considering you and some other candidates for this position, what makes a difference in selecting you for the specific post? Don’t get yourself hooked up with this one, as this one may be the last one standing in between your job and you. So with full confidence focus on the strengths you have and which you will possess during your job apart from others. Keep all these four points in mind and speak on your strengths correlatively to the post you have applied for in the grocery store. These four points are like the only key to open the closed doors of the job you need, these four points distinctively tells about you in a brief manner. Well we have discussed a lot of difficult possible interview questions for job interview and provided with the suitable answers. Hope that these few points on grocery may have helped you out while going in for an interview. When you have done your home work there’s no room for right or wrong answers, the only thing that matters the most is that the best suitable answer that you give to the question asked. So always go prepared for the interview and all the tough ones will always be easy to answer.